The infographic below is intended to give all new website owners the best possible start to their marketing efforts. There are always going to be more tips for new and existing website owners so to keep up to date with the latest marketing, web design and web development tips, follow the WATB team on Twitter or join our mailing list. So you’ve got a website. But what now? It’s time to get people (or more importantly, your potential customers) to visit your site. Here are WATB’s top tips to drive users to your website through the power of digital marketing. Let’s take a look at one of the very few digital marketing shortcuts a business can take when trying to appear to their target audience on Google search… meet, Google Local. A simple, obvious and yet often forgotten staple of Google search is to have your business appear on Google Local. Once set up, your business will almost instantly be appearing for your primary service. 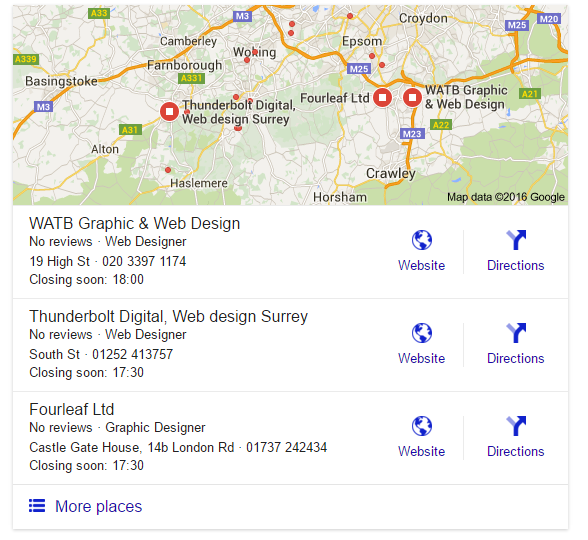 Take a look at how WATB appear on Google (thanks to Google Local search) for one of our most popular services “Surrey Web Design”. Action: It’s very little work to set up Google Local so we have created a step by step guide on how to do it – Are you setup on Google Local? Have you heard of Facebook, Twitter and LinkedIn? Of course you have, if you haven’t already got a personal profile on these social media accounts, you probably have a pretty good idea what each platform does. Social media websites and apps are some of the most popular sites in the world. They host profiles and activities of your friends and family, your business colleagues, celebrities, big brands, little brands, and most importantly, your customers are probably already active on social media. 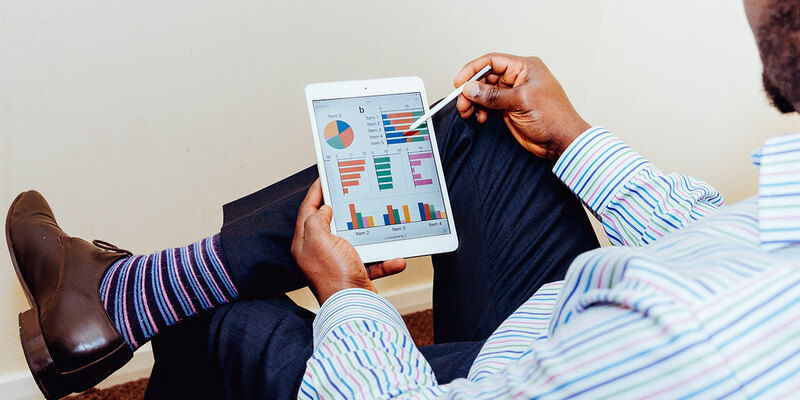 By setting up social media profiles, posting and sharing content and getting involved with conversations in your industry, you will be able to connect with your potential customers, building your brand and attracting traffic to your website… this all helps build sales. Actions: Set up social media account for your business on Facebook, Twitter and LinkedIn. Post regularly and be sure to reply to any comments and messages. Even if you only spend 15 minutes every Monday and Thursday to check your social media accounts, it is often enough to get you started. Write naturally. Don’t try to be too salesy. This is most important point as readers will be turned off by boring, in-human content. Be unique. This is your chance to provide your audience with truly impressive content. It can be informational, it can be humorous (but be careful with that one! ), it can be inspirational or it can tell an interesting story. If your audience wants to read it, you’re on to a winner. Do a bit of keyword research. With help from keyword tools such as Google Keyword Planner, you can learn what your audience types into Google when looking for a product, service or piece of content that you could provide them. Match your research up with your naturally written, unique content and watch your website and social media visits increase over time. Action: Begin writing new content on your website. Start with your blog and write an article related to your business, industry or offerings and put in your keywords from your keyword research. Try to get in the habit of writing at least every other week. One of the undisputed methods of helping your website to rank higher on Google is by having high quality links from other websites point to your website. Think of these links as other websites giving you praise. It makes your website look more popular and (at least suggests) that your content is something users want to see. A good example of this is with our own brand, WATB. We recently had a link to our website set up thanks to a blog written about our responsive design on the blogs.adobe.com. You may well have heard about “Adobe” and that is a good sign for us as the better the website that links to yours, the more powerful that link is. Action: Think about potential areas you could gain links from and ask for a link to your website. To get started you might want to consider contacting venues you work with, partners, suppliers, charities or even clients. Image optimisation is often forgotten about, but it is still very important to get right. If you want to help your page and image rank within Google and Google Image search, you will need to ensure you optimise your images to be picked up by search engines. Just as we saw in Tip 3 – Content is King, you will want to perform keyword research for your images. Check what users are typing into Google using the Keyword Planner and you will be able to optimise your image. There are two key ways to optimise any and all of your images by optimising the image file name and the “Alt Text”. Action: Ensure your image alt tags and file names are optimised. Describe what the image shows and insert your keywords from the research you undertake, where appropriate. Sending E-Shots, or emails, to your database of clients, old and new, can help drive traffic to your website. The latest email software can make it very easy to send emails out in as little as 20 minutes. If you are keeping up with writing new great content, make sure the people who are already interested in your services and products are receiving your latest content updates and product offerings by sending them an email about it. Action: Start collecting email addresses. Sign up to a mailing services such as MailChimp and send an update/newsletter email to your database every 2 weeks. The final tip is to make sure that your messaging, colours, logos, product/service information and everything you do online is consistent. This includes most importantly the messaging on your website, social media and in any e-shots you may send. If someone is interested in your offerings on social media but come to a website which doesn’t sell the same items or services, the potential customer is going to go elsewhere. Action: Think about your overall brand strategy and ensure you keep content and design consistent across all digital marketing areas. one of the very few digital marketing shortcuts a business can take when trying to appear to their target audience on Google search… meet, Google Local. A simple, obvious and yet often forgotten staple of Google search is to have your business appear on Google Local.